Since the PM declared that he is about to build 3700 houses, pictures of the banana shed/copra houses that are being built by the government have surfaced and now people have moved from doubtfulness to optimism. The Prime Minister just needed to explain that the 3700 houses would be 8 x8 villas similar to the ones being built in Grandbay with copra house type architecture- In stark contrast to the Renneth Style Architecture that we see at the Savanne Paille villas. MiTC has also been monitoring some houses that are being built by government handlers with the assistance of the Samaritan Purse. The Samaritan purse is an international evangelical Christian disaster relief organization. The volunteers from the Samaritan Purse are supposedly helping with the construction of houses particularly in the North of the island however the government and its handpicked DLP operatives are leading the operation with the distribution and coordination of the resources (material and Labor) and as expected the DLP gang decides who gets the assistance. As always anything handled by Skerrit and his goons is based on electioneering tactics and as such things always turn out to be upside down, inside out and back to front. People are now asking why the government is building so many “Tarpaulin Homes”. The name Tarpaulin Homes comes from the fact that the government and its operatives are rushing to set up building frames and then the people are given tarpaulins to wrap around the building frames. The buildings are left unfinished and the often jobless occupants are left to figure out how they are going to provide a somewhat resilient or safe enclosure to their Tarpaulin Houses. In keeping with the Skerrit motive of keeping the people bamboozled and happy with less than mediocrity, the idea of building so many unfinished Tarpaulin Wrapped Houses helps create the false perception that the Skerrit government cares but as we all know it, Mr. Skerrit and his bushwhackers only care about greed, power and the art of keeping the people dependent and rashly loyal to Skerrit. The rush to erect so many “Tarpaulin Homes” has also resulted in the unfair distribution of these half-finished houses. Friends and supporters of the Dominica Labor Party are receiving multiple unfinished units and in some instances are using the unfinished units to set up rum shops. There are cases where Laborites who either did not own a house before Maria or did not have structural damages to their houses are desperately finding plots just to have the Tarpaulin Home foundation built. While this is happening people who are truly in need of building material are not receiving the material from the government. The perpetuation of the “Some Eating All “ behavior e that has been nurtured and promoted by the Roosevelt Skerrit regime. We were also disturbed by the fact that the entire Tarpaulin Home building process is conducted in a desultory manner and seemingly without proper intervention by the Physical Planning Department. It appears that the “Tarpaulin Homes” are being configured on a “one size fit all “basis. A family of 6 or 8 gets the same size structure as a single or two person family. We also notice that the red toilet initiative is no longer important as these Tarpaulin Homes are erected without sanitary facilities. What we may be witnessing here is the making of another “City Soleile “as seen in Haiti. While many are wondering whether it is possible to erect 3700 houses particularly before the election, people have been receiving standard partially completed building frames with roofs and tarpaulin wrap façades. 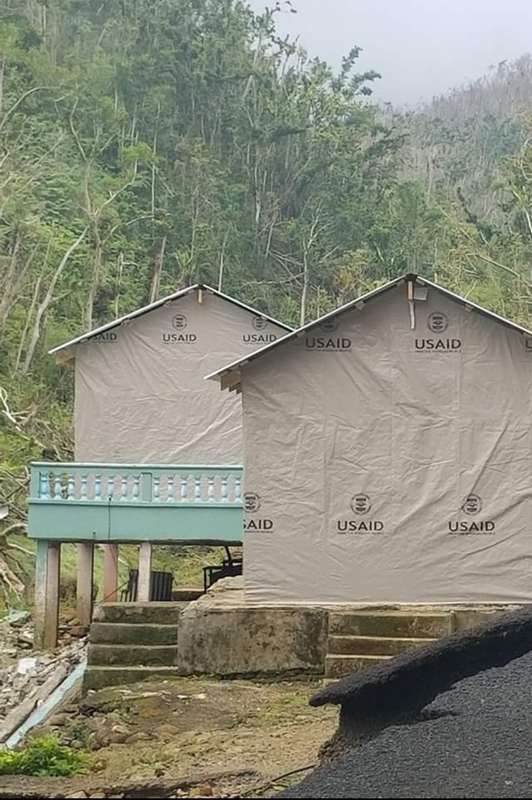 In fact a section of the Village of Bense is now named “ Samaritan Purse” because of the number of unfinished “Tarpaulin Homes” that have been erected by the Skerrit regime.